The CEO of the risky junk bond mutual fund that blew up last week has stepped down. The Third Avenue Focused Credit Fund focused on the riskiest corners of the junk bond market, investing in distressed debt of companies that were close to defaulting on their loans and ones that already had. Last week the fund announced it is liquidating and blocked investors from getting their money back. Its implosion is a very rare event in the normally-sleepy mutual fund industry and highlights the turmoil rippling through the riskiest parts of the bond market. The event also raises questions about whether Third Avenue's focus on extremely risky and difficult to trade assets was really appropriate given the fact that mutual funds promise investors the ability to take their money out whenever they wish. "It is irresponsible to run the fund in such a way that they can't meet redemptions," said Leo Acheson, an analyst at Morningstar. Third Avenue responded to the criticism on Monday by announcing longtime CEO David Barse had left. The firm said it will now be led by a team of executives. The Third Avenue liquidation also spooked already-rattled investors who were left wondering if there are more ailing funds in the horizon. The Dow tumbled more than 300 points on Friday. "Is this just the tip of the iceberg? Are there more funds having similar distress? These things tend to snowball," said Michael Block, chief market strategist at Rhino Trading. Third Avenue Management told investors on Wednesday it is liquidating and blocking further redemptions after months of heavy losses and elevated requests from investors for their money back. The fund shrank from $2.1 billion in July to just $788 million on Thursday, according to Morningstar. Third Avenue said it will return a small portion of its assets to investors next week and then will focus on unwinding its investments. The fund anticipates it will take a year or more to fully liquidate. The mutual fund says it doesn't want to resort to firesale prices just to meet redemptions. In fact, it blamed its troubles on the fast pace of redemptions combined with the lack of liquidity in the fixed-income markets. 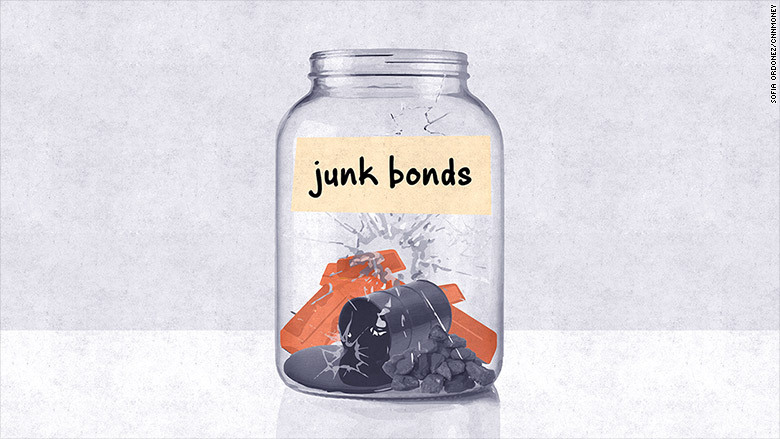 It's important to understand this was not your run-of-the-mill mutual fund that invested in junk-rated bonds. It held illiquid bonds of some companies that had undergone restructuring in the last 18 months. This type of distressed debt has gotten hammered far more this year than junk bonds. "This seems to be a pretty unique situation. This fund is definitely an outlier," said Acheson. Still, the Third Avenue liquidation is the latest sign of trouble in the riskiest parts of the junk-bond market amid plunging prices for oil, copper, iron ore and other raw materials. More companies have defaulted on their debt this year than at any point since late 2009, according to Standard & Poor's. A big driver has been turmoil in the oil patch. S&P warned that about half of energy junk bonds are distressed, meaning there is a real chance they default. "We're definitely seeing a lot of stress," said Ashish Shah, head of credit at AB, formerly known as AllianceBernstein. He said energy junk bonds are yielding nearly 14%, compared with just 2.1% for 10-year Treasury bonds, which are seen as risk free. None of that is being helped by the Federal Reserve, which is expected to raise interest rates next week for the first time in nearly a decade. The build-up to the move is easing investor appetite for risky assets. Investors yanked $3.8 billion from high-yield bonds in the past week, the largest outflows in 15 weeks, according to Bank of America Merrill Lynch.